Let me just say how much I love cool fronts from Canada. Wow, has it ever made it feel like early fall these last few days. Yesterday’s high temperature was 64F (18C)! Bookman and I took a walk after dinner to Lake Nokomis a few blocks from our house and then strolled around the lake. We wore long pants and wind breakers and kept getting sprinkled on. Just as we made it back to our front porch we had a three minute downpour. Talk about good timing. seen it and over its banks in a few lower areas. There are two swimming beaches on the lake. The smaller one is completely underwater up to the base of the lifeguard tower which sits up at the top of the beach. The larger beach still has beach but its about half its usual size. It was too cold and windy for swimmers so the ducks were taking advantage and enjoying the swimming platform all to themselves out further from shore. There were a few intrepid fisher folk out too. And a poor man from the Department of Natural Resources sitting under a tarp all by himself next to the boat launch to do boat inspections and educate boaters about zebra mussels, an invasive species that is slowly finding its way into many lakes and rivers and causing general environmental havoc because it has no natural predators here. With only one boat out in the water and not likely to be anymore, the poor guy looked rather bored. There has been quite a lot of shoreline restoration done around the lake over the years with native plantings that help keep the water clean and attract wild life. Aside from birds and a rabbit, not much was out and about. It was nice to be able to recognize plants that I have growing my own garden though. 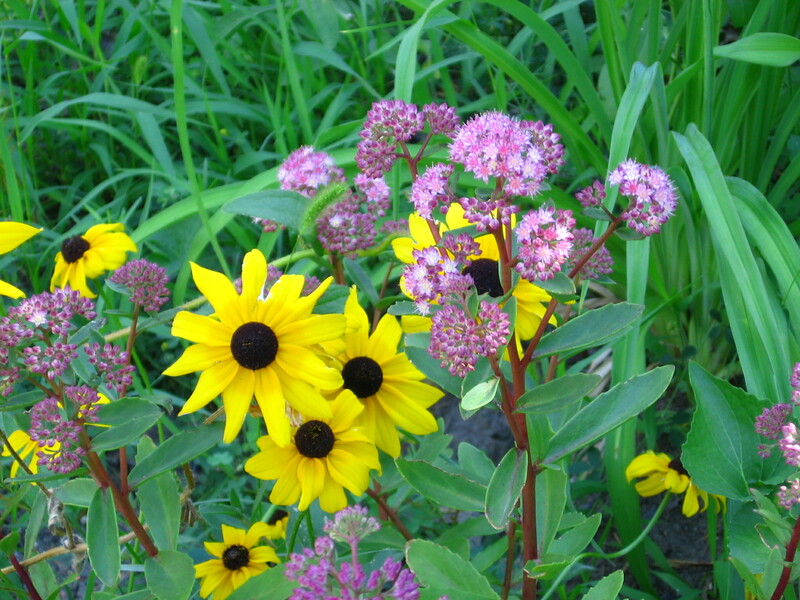 Plants like wild bergamot, milkweed, black-eyed Susan, coneflowers and asters. In the veggie garden, the sudden breath of cool air put a halt to the sudden attempt at recovery my tomatoes and bell peppers were making. It also slowed down the zucchini and cucumbers. The pumpkins though have reached the point where nothing is going to stop them. We are in pumpkins take over the garden time. As much as I try to direct their vines where I want them to go, they pay little heed and go where it suits them. 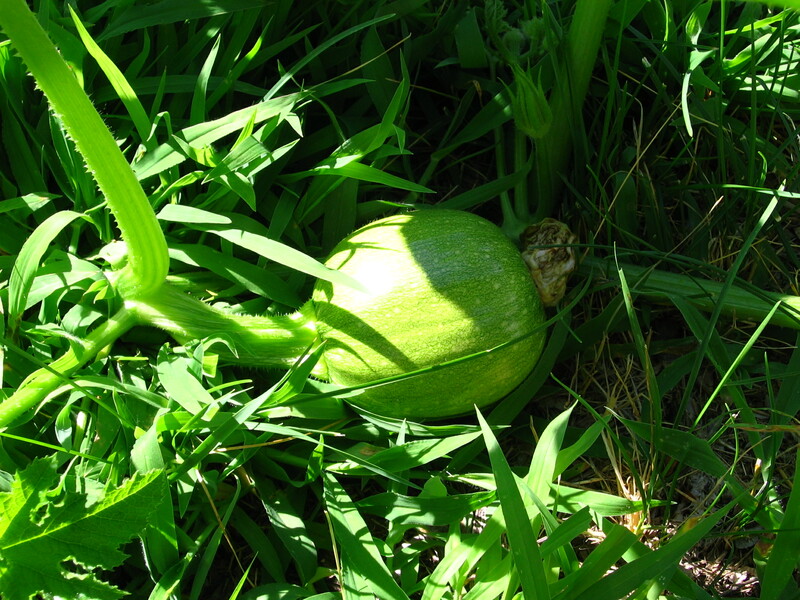 But we already have small pumpkins coming on. The largest one is about the size of a softball, the smaller ones about golfball-sized, and the plants are still flowering. I have no idea how many there are. The more the merrier I say. I love pumpkin and can never have too much. The beans are still going crazy. I picked another big bowl today and there are still more getting ripe and still more flowers. The purple beans seem to all get ripe at the same time, I pick them and then there are no more for about two weeks. The yellow beans just keep going and going with beans in all different stages. It’s really great and we’ll have beans in the freezer well into winter. Good thing we like them! The frog fountain I got for the garden in lieu of Bookman building me a pond is a really wonderful addition. It draws insects and birds galore. It’s especially fun to look out the window and see a bird splashing in it. When I am outdoors in the garden I love catching the sound of the water falling into the bowl. But I think I got the short end of the stick and should have insisted Bookman make me a pond. A pond would mean we’d have a few fish in it and plants and other than keeping it filled it would require not much work. And if there was work that needed to be done Bookman would be the one to do it since he knows ponds and fish. the pump that gets clogged with algae and grit. Wash the ceramic bowl clean of algae, the occasional dead insect, and bits of plants and grass and seeds. And wash the two rocks clean of slimy algae. Then I have to put it all back together again and fill it up with clean water. It takes as long as half an hour sometimes, fifteen to twenty minutes most of the time. So fountain, my responsibility, lots of work. A pond, Bookman’s responsibility and no work for me. See why I wanted a pond? I wonder if in a year or two I can casually reintroduce the idea to Bookman and get him to bite? On second thought, since I have just written that, I’m guessing not. Not too many new things coming into bloom this week. The liatris is going strong and looking great. 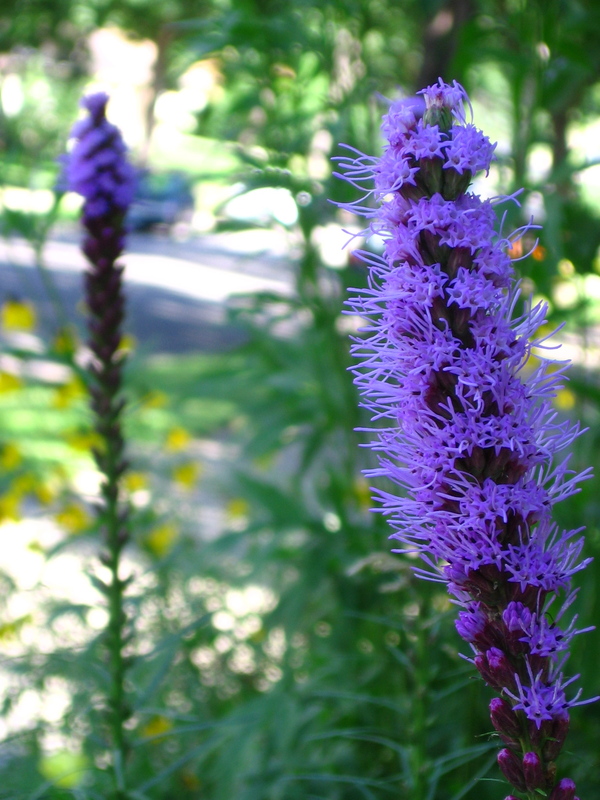 The variety I have blooming right now is purple blazing star, a native to the area. The stonecrop sedum in my front garden is starting to bloom, variety emperor’s wave. It looks great next to the black-eyed Susan that planted itself there. 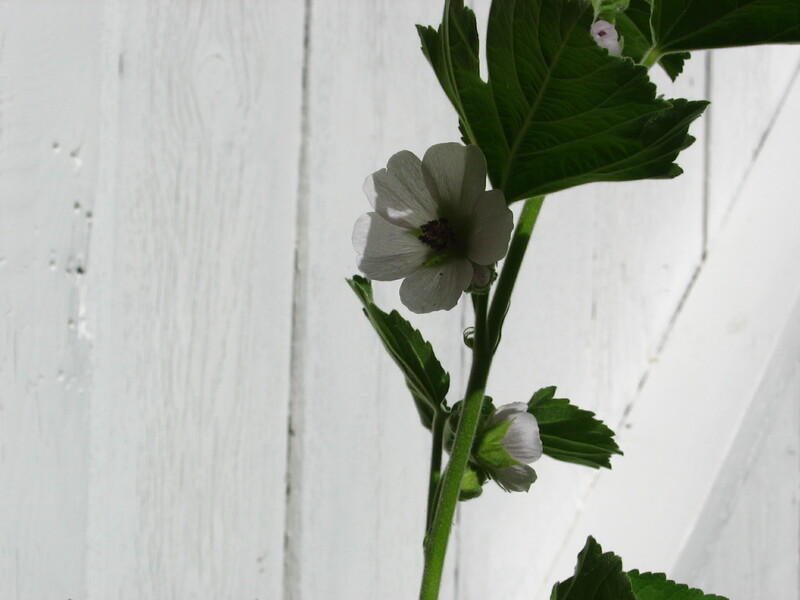 I planted a marshmallow in my small and narrow side garden and it is doing pretty well, well enough to bloom. You can’t really tell from the photo, but the flowers are white with pink middles. They are small and bloom along the upright stalk of the plant. Very pretty. I had hoped to be able to plant scarlet runner beans at the base of my corn stalks along with pumpkin. The three things together are a traditional growing triad that has long served Native Americans. The three plants are mutually beneficial (beans fix nitrogen for the nutrient hungry corn, corn gives the beans a stalk to grow up, pumpkin shades the ground slowing evaporation and shading out weeds). But we all know by now why I don’t have corn (blasted squirrels!). So I planted scarlet runner beans in random places around my garden, on fences and at the base of this pole that has a wind chime hanging from a hook and an empty bird feeder that I have been too lazy to take down because I also kind of like it since it is wood with a little shingled roof and little perching places that look like twigs. It had seed in it once two winters ago until the greedy little squirrels realized the wood is soft and chewed the feeder holes so big the seed doesn’t stay in it but pours out the side. So the scarlet runner beans are blooming and while the flowers themselves are not big and luscious, their bright red color is really pretty and I’ve decided I like them quite a lot. They will be returning again next year when, I hope, in addition to growing up my little pole, they will also be growing up corn stalks (ever an optimist!). Bookman and I had hoped to be working more on our garden path in the cool weather today especially since on our walk around the lake yesterday we passed by one of the free wood chip areas and there was a huge pile. Bookman drove over with our buckets about 9 this morning and there was nothing left. Sigh. So we had to resign ourselves to weeding. I think next time we see there is a big pile of wood chips I will station myself there and look menacing while Bookman hurries home to get the car and the buckets. I will use my garden kung-fu to fight off all comers. You’ve been warned so it’s best if you just stay away. I don’t want to hurt anyone but I will if I have to. Arti, just keep sending the cool! 🙂 I love fall, it’s my favorite season. I’ll get to harvest those pumpkins and my apple trees are loaded with apples this year. Plus, as you say, there are migrating birds to watch. Winter isn’t so bad at the beginning anyway. By February I’m tired of it but that only helps us appreciate the non-winter months even more! Danielle, they are pie pumpkins for eating 🙂 Yup, there is a small lake four short blocks from my house. It is part of the chain of lakes in Minneapolis that are all connected by parks and bike paths. Mine, Lake Nokomis, is very neighborhood-y. Most of the other ones are really busy and draw people from all over the city and the suburbs but “mine” is quiet and relaxed, a great place for walking and picnics. I love people watching, it is one of the only things that make trips to the Mall of America bearable. It has been hot and humid (surprise!) here in coastal Georgia. It isn’t pleasant to be outside after about 10 a.m., but I’ll have to get out there next weekend for sure. I have a kudzu type of vine that is enveloping everything and my obnoxious neighbor threatens to “spray” so it doesn’t invade his space. I tried to explain to him I don’t “spray” on my property, unless its bona-fide envrio-friendly. I’m not a fanatic, but I don’t want chemicals – and I have a cat who likes to cavort in my yard. But since I also want peace in the valley, I’ll have to take the time to rip it out next weekend. 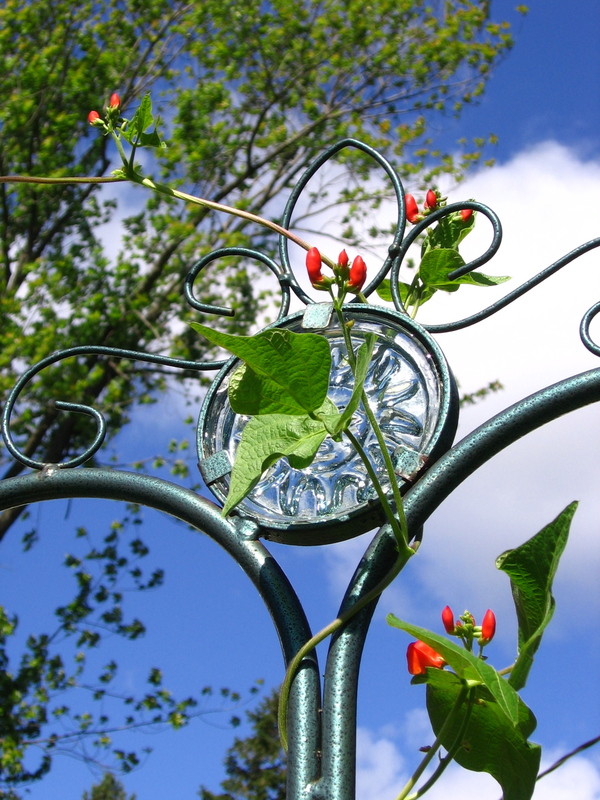 Oh, and I love scarlet runner bean. I had forgotten I planted some way back in my gardening days. Litlove, I was surprised at the muck and slime in the little fountain. I expected a little but goodness algae grows fast! The birds and bees do like quite a lot though so its’ worth the effort. But it’s probably good I didn’t know about the required effort before I bought it! I have not seen the Curse of the Were-Rabbit but now I am going to have to go find it! Oh I’d be cranky about windbreakers in, say, late January here. No, no, no, I’d say, go away for another couple of months! I promise, that I’ll keep away from free woodchip piles anywhere (just to be safe) in Minnesota! A pond isn’t exactly maintenance-free, but I don’t mind the 10 minutes or so I spend every day cleaning debris that has fallen. Keep working on Bookman to build one. I’ve started to plan what sort of screening/netting I will use once the annual parade of falling leaves begins. One of my fish has either gone into hiding or was a nice meal for some creature – one of the downsides to have a nature-friendly backyard. I love hearing the sound of the waterfall and have considered building a pondless waterfall elsewhere in my yard, but your description of the yucky fountain has me rethinking that. Anne Camille, I wouldn’t mind a few minutes a day cleaning out the debris with a net, at least you don’t have to take the pump and filter apart and change the water! Yes, if we should ever really have a pond we’d have to carefully plan it to be sure fish had a place to hide from the raccoons. I like the sound of water too. A pondless waterfall might be a little different than a fountain since the water moves more there might be less of an issue with algae, but you’ll likely be cleaning it more than your pond. We tried Howden pumpkins this year and the vine dominated that patch. I spent about two hours on Tuesday lifting the vines and weeding underneath. There is a (new to our garden) grass that is challenging to my trowel and to my pulling abilities. We have had some real autumn-like weather here off and on over the last couple of weeks and it has got me in a RIP mood far too early. Ended up reading a Louise Penny novel and am trying to control my urges to dive into my RIP pile. Just a few more weeks…must…hold…out…. Carl, it’s crazy, isn’t it? I’ve been thinking of RIP too. I’ve got some good books lined up and I can hardly wait!